Sad! Authorities found the mother of all scores this week during a narcotics operation on highway 31 in central Indiana. The Operation called “Operation Blue Anvil,” which spanned across 9 different agencies over the state. A unique pill formation was found resembling the current POTUS, Trump ecstasy pills. 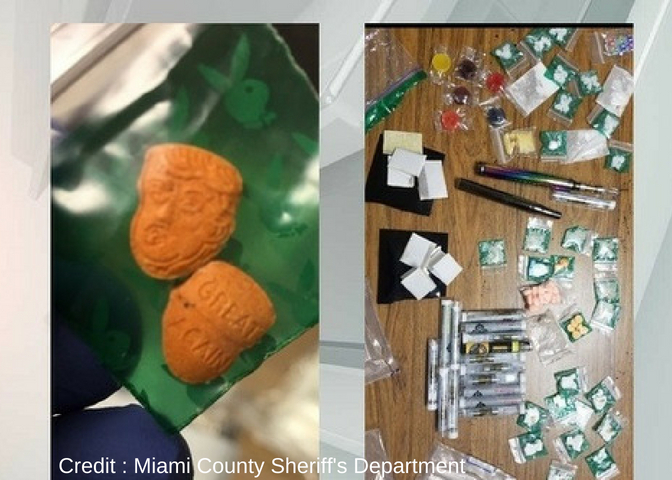 Also found was marijuana, marijuana edibles, heroin, meth, cocaine, LSD, prescription medications and psilocybin mushrooms were found over the 6 day patrol that resulted 272 drug charges and 129 arrests. . Of the 272 drug-related charges, 48 were felonies. They also issued 193 traffic citations and made three arrests for driving while impaired. From June 19-21st and again June 26th-28th, the multiple agencies worked together to catch people using the highway to transport and distribute illegal narcotics. Ecstasy pills can sometimes kill drug takers but more commonly induce nausea, panic, paranoia and agitation. Death can occur when a user’s body overheats and cause convulsions, dilated pupils, low blood pressure and accelerated heart rates. Consumption during the hot summer months can be increasingly dangerous and fatal. Increased water intake is encouraged to offset the side effects of drugs, but too much water can also kill a user as well. Similar pills were found last August in Germany, after showing up in Britain and Germany. They were claimed to be stronger in strength than most on the street doses, with one side of the pill showing Mr. Trumps’ face and large hairstyle, the pill became a popular favorite quickly.